Amazon pulled out of its deal to place one of its HQ2 headquarters in Long Island City yesterday. Their choice is one that will have many consequences for New York City. There is much speculation about the repercussions this decision will have on the economy and whether it will have a cooling effect on the willingness of other businesses to make New York City their home. There is no question that the jobs that Amazon promised to bring were a welcome reinforcement of the New York City’s appeal generally, as well as the confidence in our educational institutions to provide a strong pipeline of potential employees. While we should not be overconfident about our allure, we should also not behave as though incentivizing economic development is beneath our dignity. New York City needs investment, just like any other city. New York is not a one-size-fits-all city but we are competing for better or worse, on a global scale. 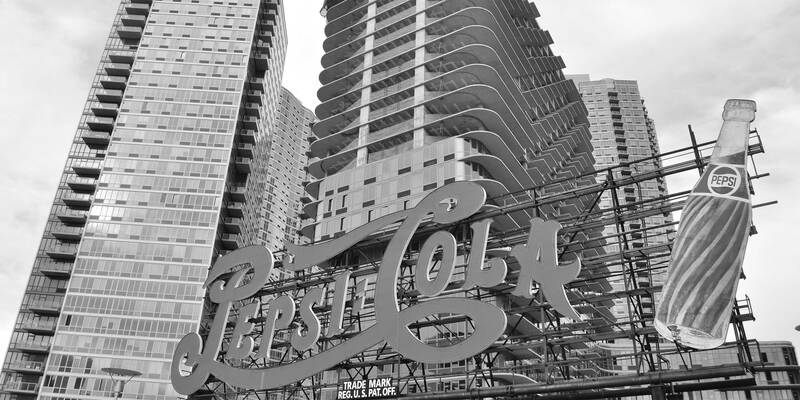 Pepsi-Cola sign at Gantry Plaza State Park in Long Island City. Photo: Wikimedia Commons, Joe Mabel. That said, it is equally important that our partners take care to understand what New York is all about. There is a reason our public policies are often copied around the world. (That doesn’t mean that MAS doesn’t think they should be even better!) Running the gauntlet of community engagement and public process is the part of the cost of doing business here. Our appeal has not gone away. However, the missteps in the roll-out of the Amazon deal were myriad and assessing those mistakes with clear-eyed perspective is going to be critical for moving forward. We can either learn from the lessons of the Amazon potential relocation here, or we will be doomed to repeat its mistakes. For every New Yorker’s sake, MAS sincerely hopes that we figure out how to do it better next time.